My name is Corrine and I live in Melbourne with my very supportive husband of nearly 7 years and our little man/shoe tester! My husband and I have been together since high school and, after finishing university, lived and worked in the UK for three years before settling back in Melbourne to renovate our house. I'm currently on maternity leave from my job as a maths/science high school teacher and having found some extra time (and equipped with my mums old sewing machine) started sewing and Teddy & I was born! Teddy & I has been open for nearly a year now and it's been a wonderful, crazy ride. From customers to other sellers I've met so many lovely people and there isn't anything more satisfying than seeing photos of little ones in Teddy & I.
Teddy & I was created when I was looking for some trendy, affordable baby shoes for my little man to wear to help him grip when he started to stand and cruise. I couldn't find what I was after so I decided to make some myself. With a little encouragement from my family and mothers group I decided to open my made it store and I haven't looked back since. Teddy & I make a range of cloth and leather baby shoes and bandanna bibs in a range of sizes from newborn to 24 months. I like to offer customers choice and by making all my shoes to order I can offer that choice, whether it's to line their shoes to make them warmer or to change a heel colour, I really enjoy making custom orders. I use a range of high quality quilting cotton and bamboo fabrics and tend to be drawn to geometric patterns. I aim to create a range of products that are affordable, high quality and wearable. I get my inspiration from fabric stores and websites. I love sitting and looking through the fabric designers' websites and looking at what fabric is going to be released soon. I really like geometric patterns and love working with a variety of colours. Once I have an idea for a new design I make a few pairs which I test out on my little man and brand reps to ensure that the fabric stands up to some wear and tear and washes well before they hit the store. My mum is an amazing sewer and crafter so I've grown up watching her create gorgeous pieces. It wasn't until my mum gave me her old sewing machine after I'd just had my little man that I discovered my love for sewing and now I'm hooked. I've got so many ideas and so little time. Next on my list is to learn how to screen print as I'd love to be able to create some of my own fabrics. My little man's nickname is Teddy so it seemed a good choice as he was one of the reasons I started my business. I love browsing fabric stores in person and online. 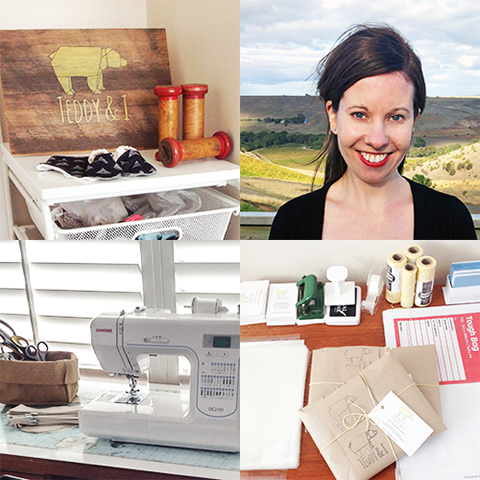 If you are thinking of starting a handmade business I'd say go for it. Have a look at the market and see how you can stand apart from other sellers. I'd recommend checking to see if your business name has already been registered as there would be nothing worse than having to change your business name if it's already being used by someone else. Local hobby groups often offer cheaper group business insurance which will cover you for markets and online. To be successful you need to utilise social media; networking with other businesses on Instagram and Facebook is a good way of increasing awareness of your brand. You need to create a clear brand and style for your store and carry that through from photos to packaging. But the most important tip I would give any seller is make sure your customer service is amazing. Customers buy handmade for that personal touch, so offer custom changes, email customers after an order has been received and let them know when the item will be posted and email them again to let them know when it has been posted. Luckily I haven't learned any disasters but I would recommend that if you see a fabric you love and there's not much left buy it all! I enjoy spending time with my family and travelling. Website: refashionista - a great blog about how to refashion and recycle your old clothes. A day at the beach spent with my family followed by a nice, relaxing dinner with my husband. Zuri - I've got so many favourite sellers who make Children's items but my favourite for items for me is Zuri as Holly makes amazing jewellery.